INDIANAPOLIS — Eli Lilly and Co. has rolled out to pharmacies the Humalog Junior KwikPen, which the company describes as the only prefilled, disposable half-unit insulin pen. 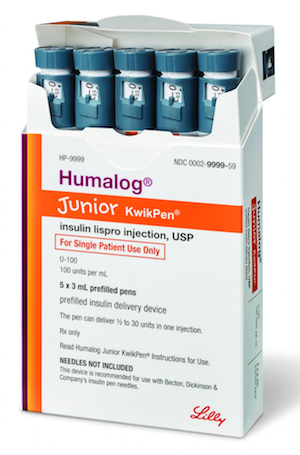 Humalog Junior KwikPen (insulin lispro injection 100 units/ml) is lighter and shorter than other half-unit insulin pens and provides a diabetes treatment option for people who prefer a prefilled pen and need the precision of half-unit dosing, according to Lilly. Those users include people with insulin sensitivity and older adults for whom rounding to the nearest whole-unit dose isn’t adequate, the company said. Thus far, the only way to deliver half units of insulin with a pen has been via a reusable pen, which requires users to remove and load cartridges, Lilly noted. In contrast, the Humalog Junior KwikPen offers fine-tuned dosing in a convenient, prefilled disposable pen. “Learning how to inject insulin can be overwhelming, especially for newly diagnosed children and their caregivers. People often feel shock and anxiety and may struggle with the reality of fitting diabetes into daily life,” explained Sherry Martin, vice president of global medical affairs for Lilly Diabetes. “We hope to help take away some of the worries about the injection process with Humalog Junior KwikPen. “Because it is prefilled, there are fewer steps for people to learn, and the half-unit increments make dosing more precise,” Martin pointed out. Humalog Junior KwikPen provides finer dose adjustment (0.5-unit versus 1-unit increments) for people who take relatively small doses (≤30 units at meal times) of Humalog U-100 (insulin lispro injection 100 units/ml). Lilly said the design of Humalog KwikPen meets or exceeds the requirements and standards for needle-based injections set by the International Organization for Standardization. The Humalog Junior KwikPen received Food and Drug Administration approval for the treatment of diabetes in June. Lilly said final approval of the product in the European Union is expected later this year. In September, the Committee for Medicinal Products for Human Use of the European Medicines Agency issued a positive opinion for Humalog Junior KwikPen. An estimated 29 million Americans and 415 million people worldwide have type 1 and type 2 diabetes, Lilly reported, citing figures from the U.S. Centers for Disease Control and Prevention and the International Diabetes Federation.